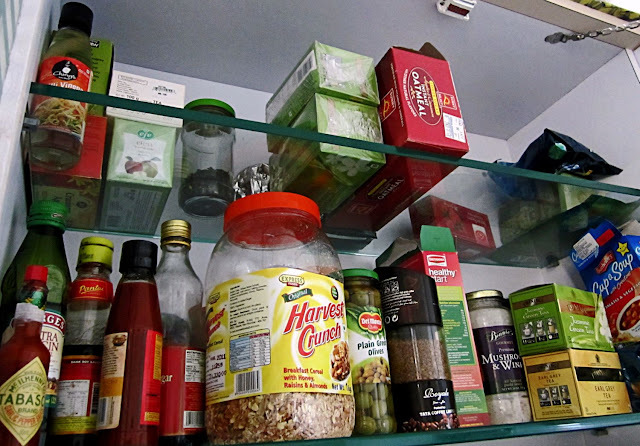 It's amazing the number of processed foods you can find in an upper-middle class home today. 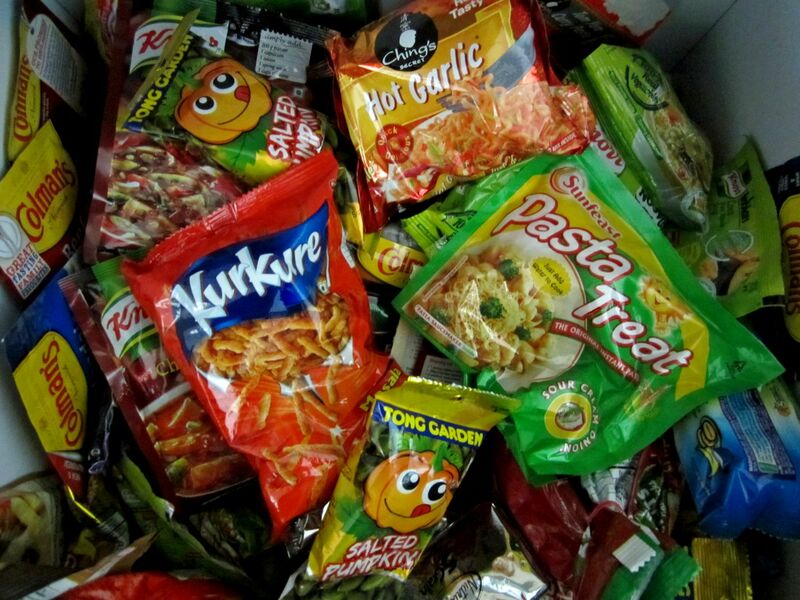 With all the emphasis on fresh goods, most well-to-do people are addicted to processed foods like noodles, pasta, and fried snacks. Not to forget that our wheat flour and refined rice and oils are all processed too! So is salt. I guess we just need to ensure that we don't overdo with the consumption of processed foods which are full of chemicals or at their best, stripped of nutrients. Many sauces are available in bottles today like Soya sauces, chilli sauces. 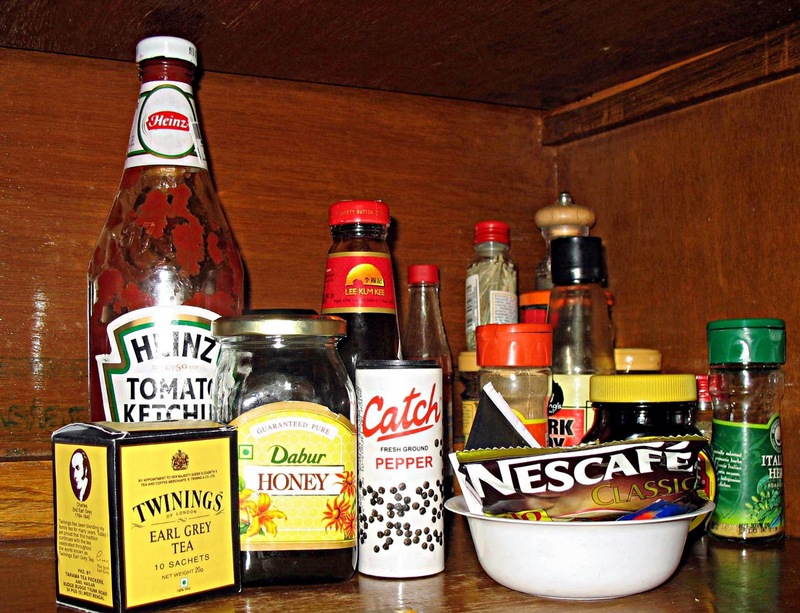 Other processed foods like soups, iced tea mixes, drink mixes, and instant oats. Breaksfast cereals like muesli is also processed, although it may be healthy and wholesome. Many of these brands are foreign like Chings and Tabasco. Various spices and available in bottles too from ground cinnamon and ginger to ground pepper and mixed herbs. Possibly these are pure ground herbs without additives, but one can never be sure. Many foreign brands dominate Indian homes today like Heinz, Twinings and Nestle's Nescafe. Related Images: Instant Noodles Stock Photo or High Calorie Food - Sausages and Fries or Ingredients of instant noodles and instant soups (Junk food) which will tell you about the many chemicals we consume! 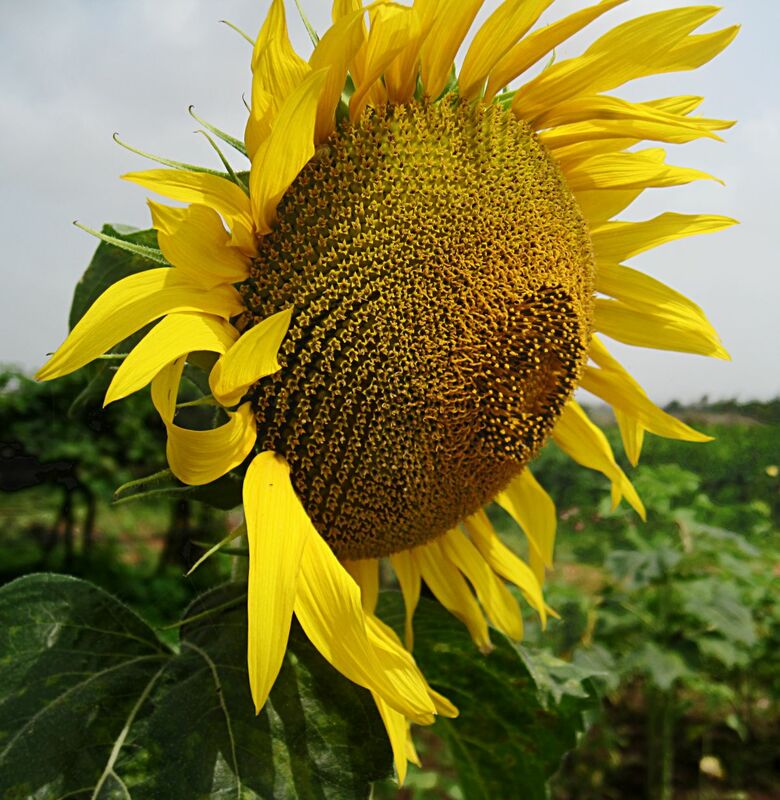 Sunflowers are not native to India and are rarely seen unless one goes to cultivated fields. 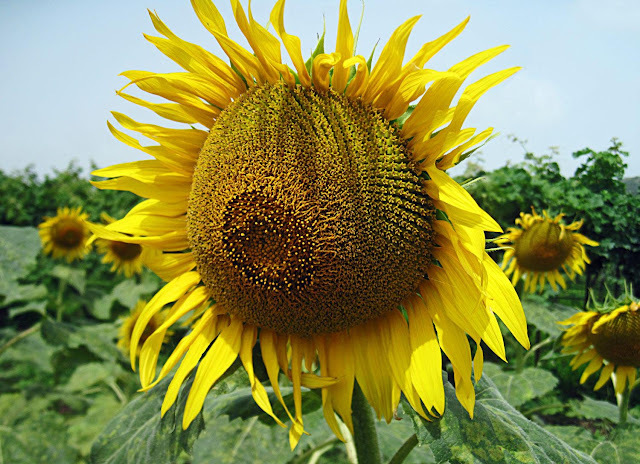 They are most used to extract sunflower oil which is popular in India as a cooking oil. 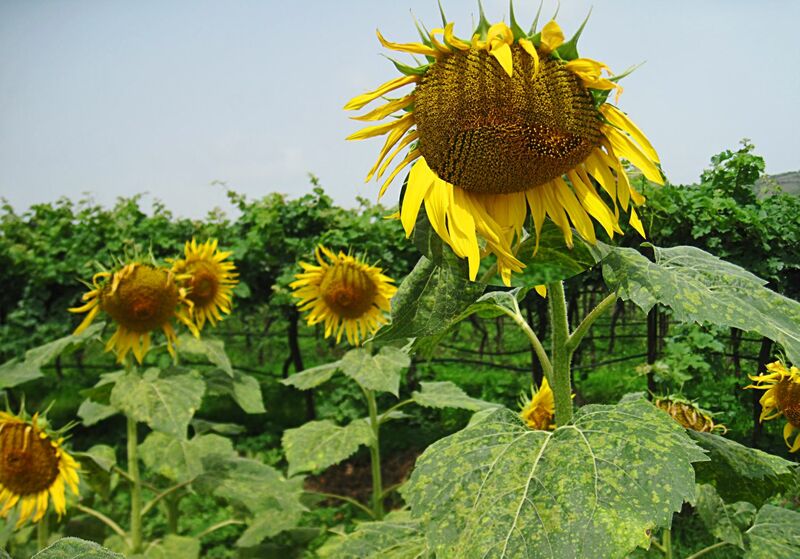 This is a sunflower field near Nashik, also spelled Nasik. In these photographs the sunflowers look a little droopy as if unable to bear the hot sun. Scraggly too with very few petals. The rest are close-ups of a large sunflower. This particular flower is bending down, almost shyly. 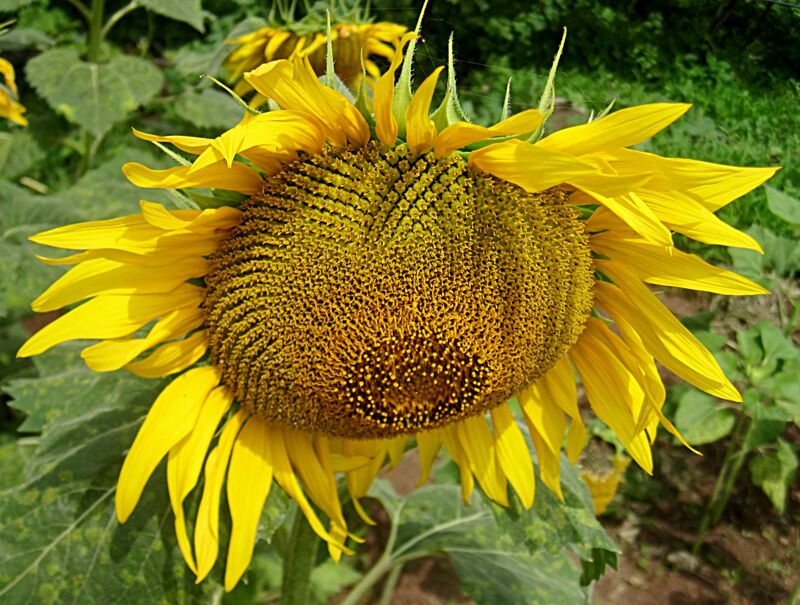 This is a view and close-up of a sunflower from the side. Unusual Hibiscus or try the label "Flowers"
A cannon is any piece of artillery that uses gunpowder to launch projectiles in warfare. There are different types of cannons. Few people use the word cannon today and the word gun or guns is mostly used. What makes these weapons interesting is that they were the the firsts forms of gunpowder based weapons used by humans, and orginated in China. Soon the rest of the world started to use them. 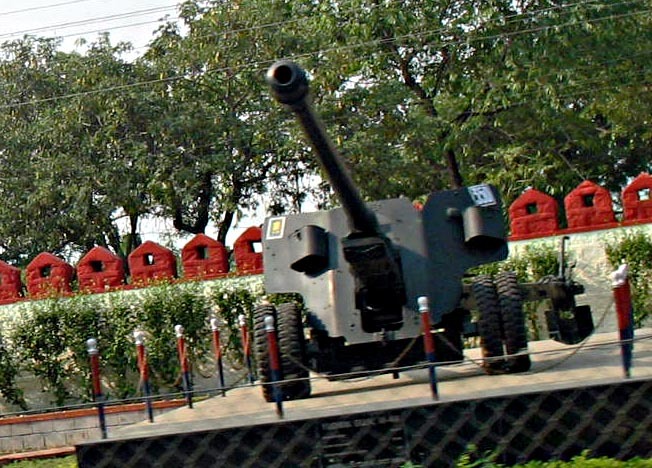 These weapons are now ancient relics and have been replaced by the use of aircraft guns and missiles. This photograph is taken at the Daulatabad Fort near Aurangabad which was built by the Yadavas of Deogiri but later taken over by the Mughals in the 13th century. The fort in which these guns are found is built on a hill and is one of strongest forts of medieval India. 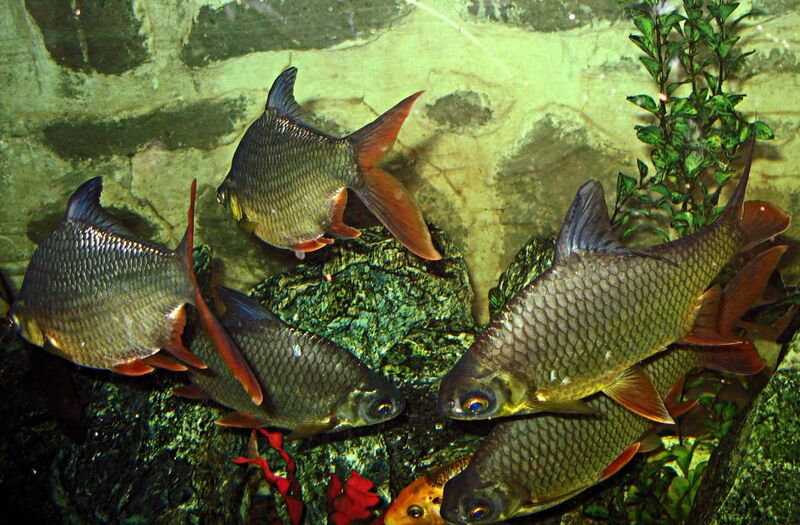 Its defense system consists of a moat and high fortified walls. 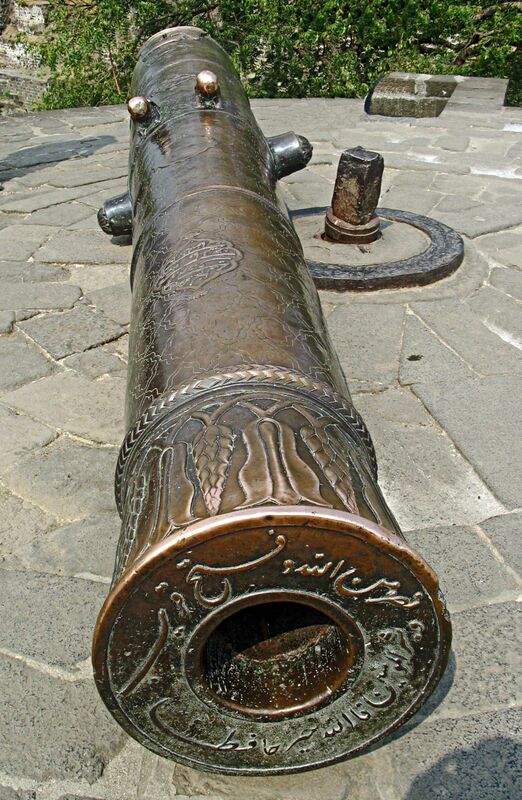 This large cannon is made of brass and has urdu or arabic inscriptions. Also at Daulatabad Fort. 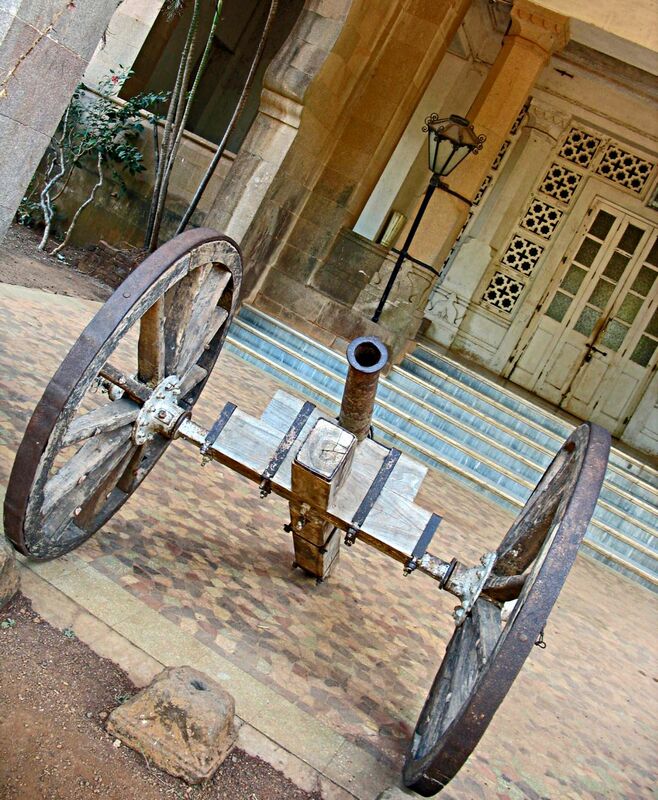 This light cannon was photographed at the Maharaja's palace in Jawahar town/village, also spelt Jawhar. It was a princely state. This photo of a relatively modern cannon gun was shot in Pune in the Army area. These are photographs of the inside of a fish tank with fish of different colours. They can used for background or for any other purpose. 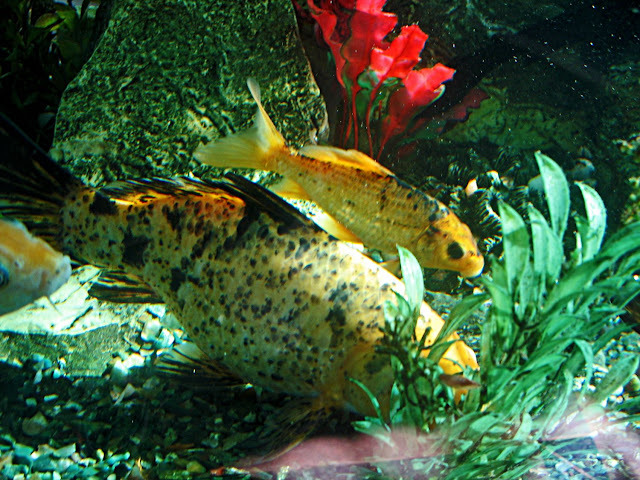 This picture has yellow and dark coloured fish swimming amongst a bed of greens. A closer look at yellow fish with dark spots. Colorful fish are what people like to see in fish tanks. 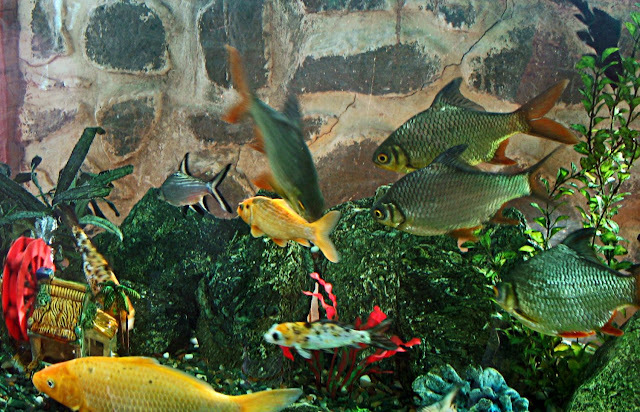 Dark coloured fish swimming in a decorative fish tank. 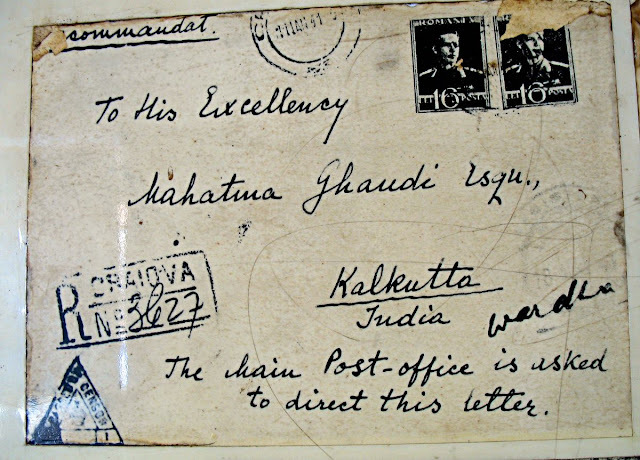 These postcards reveal how great Mahatma Gandhi was. There was no need to write his address. People from all over the world simply wrote his name and the postcard was delivered to him. Those were the days when idealism and heroism ruled! Today the post office will discard any letters and postcards without an address however well known the person is! 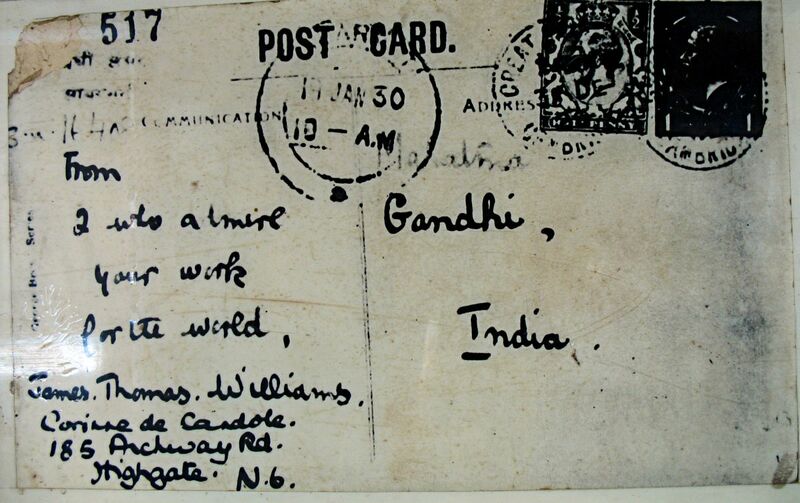 This postcard is addressed to Mahatma Gandhi, India and is sent by a James Thomas Williams from Highgate in N.G. Not sure which country it came from. This postcard also just bears Mahatma Gandhi's name and the city - Poona as Pune was called in those days. What is interesting is that it also says "The Gandhi Prison"! 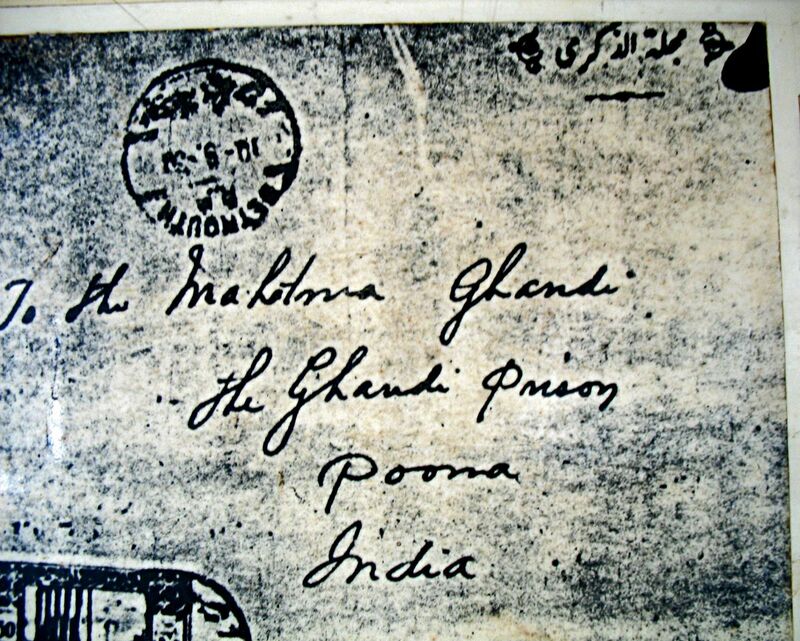 There was a time when Mahatma Gandhi was imprisoned by the British and the sender of the letter did not know the name of the prison but he was smart enough to write "Gandhi Prison"! 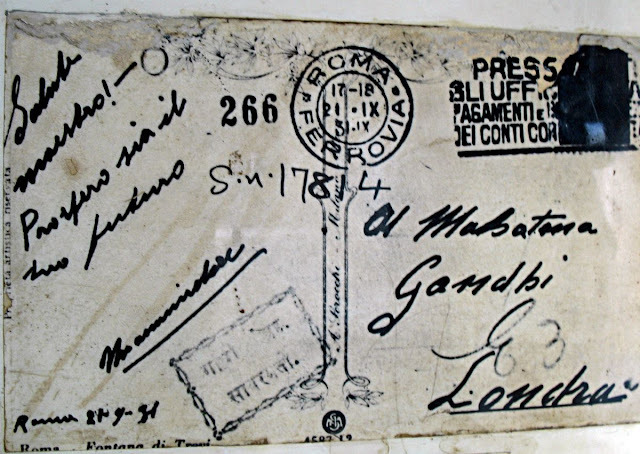 People from all over the world had heard of Mahatma Gandhi and wrote to him even though they barely knew how to spell his name. The previous writer spelt his name as "Ghandi" and this one writes "Ghanudi"! 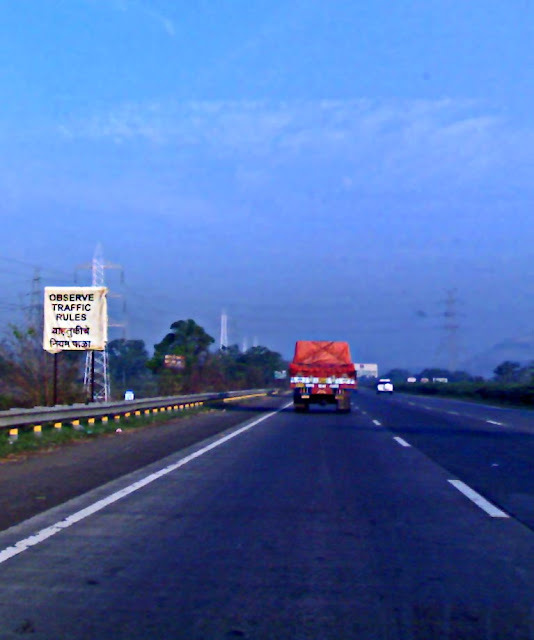 This one is addressed to the city of kolkatta, which has been spelt the Indian way "Kulkutta." 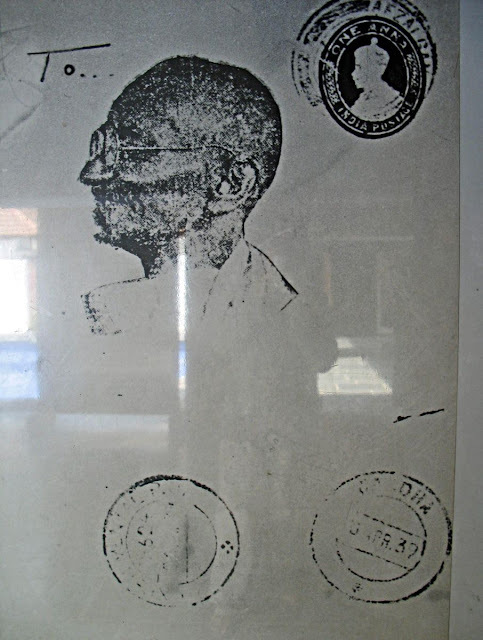 Even "Wardha" has been scribbled at the bottom right hand corner as the writer probably was not sure where Gandhi was. Another postcard written to the Mahatma without an address. This one is the best. It just has a photograph of Mahatma Gandhi underneath the "To"
Antiques can be found in street markets in India and these few photographs are from Colaba and also from Oshiwara. 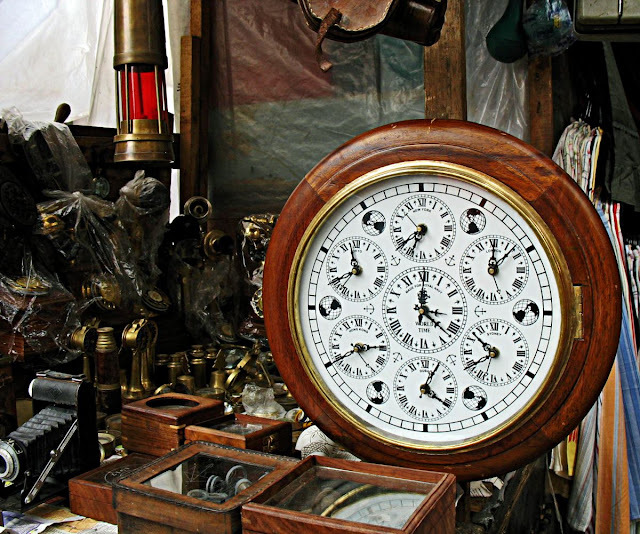 This photograph is from a street market in Oshiwara, a Mumbai suburb. 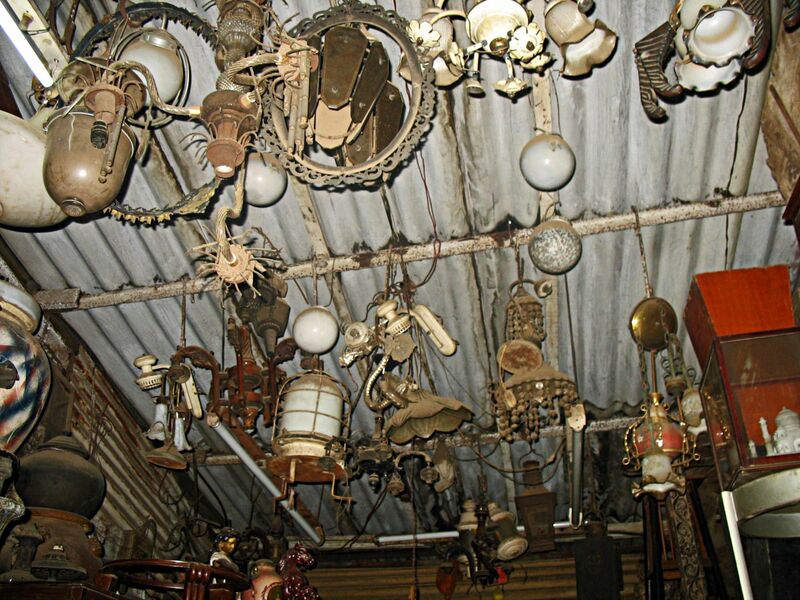 It shows some old glass lamps made of ceramic, glass, copper and other metals. There is a line of shops selling furniture on this same street which sells old furniture and accessories. 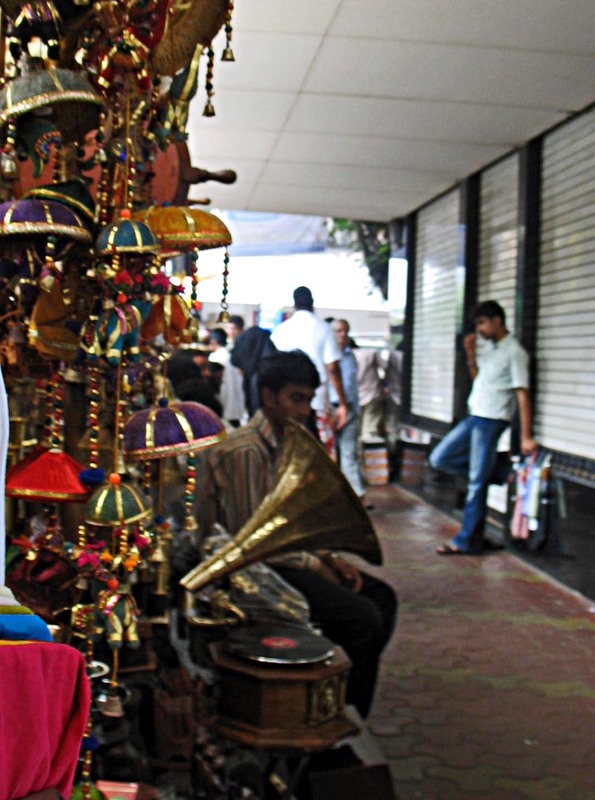 This is a view of the Colaba street market where you can buy almost everything from knick-knacks and clothes to electronics and antique objects. Mainly for tourists. This is an old antique clock at the Colaba street market. Around it one can see various old brass objects for sale. An ancient manual camera can be seen to the bottom left of the picture. These vintage objects can delight many collectors. 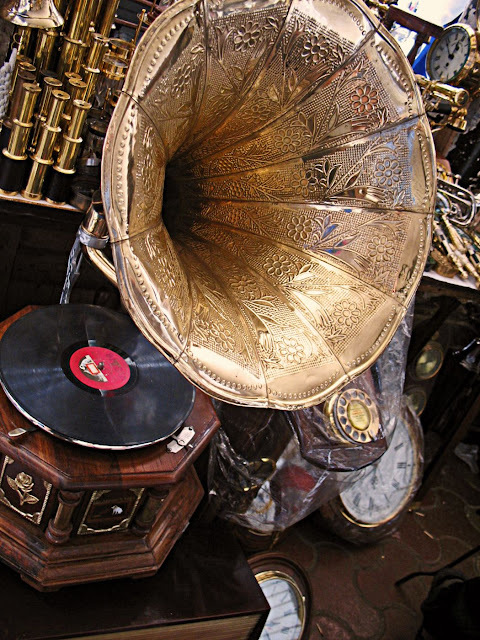 This is an ancient record player with huge speakers! Appear to be made of brass. In the old days space was not at a premium so everything was large! 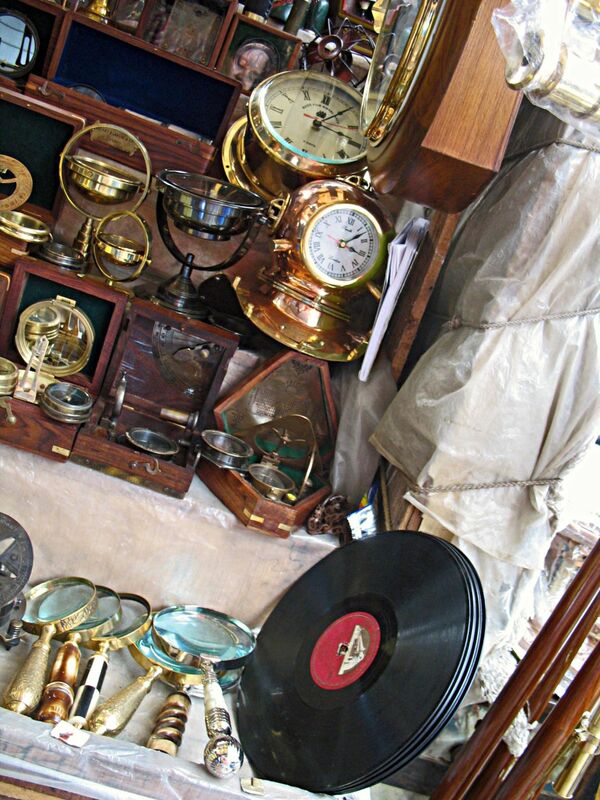 Watches, clocks and objects of different types. 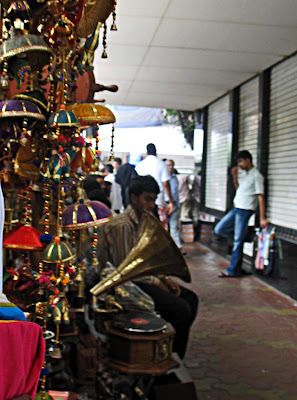 Related Images: Fashion Street in South Mumbai or Costume jewellery beads and necklaces sold at the Colaba street market. The Parthenon is an ancient Greek Temple dedicated to the Greek goddess Athena (438 BC). It lies in ruins today. It has an interesting history. Built on a destroyed temple, it was used as a treasury like most ancient Greek temples. In the 5th century AD, it was converted into a church dedicated to the Virgin Mary and in the fifteenth century Ottoman Turk converted it into a mosque. 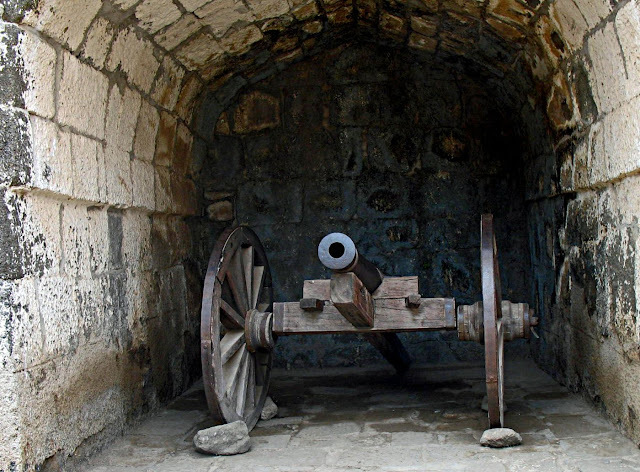 It was destroyed in an accidental explosion in the late seventeenth century as it had been turned into an ammunition storage place. In 1806, some of the remaining sculptures were removed and sold to the British Museum. The Greek government is trying its best to get them back, but it looks unlikely! After all Britain has a lot of stolen treasures, including the Queen's diamond (Kohinoor) which they stole from India. If they give Greece back its sculptures there will be a line of countries demanding their treasures back! 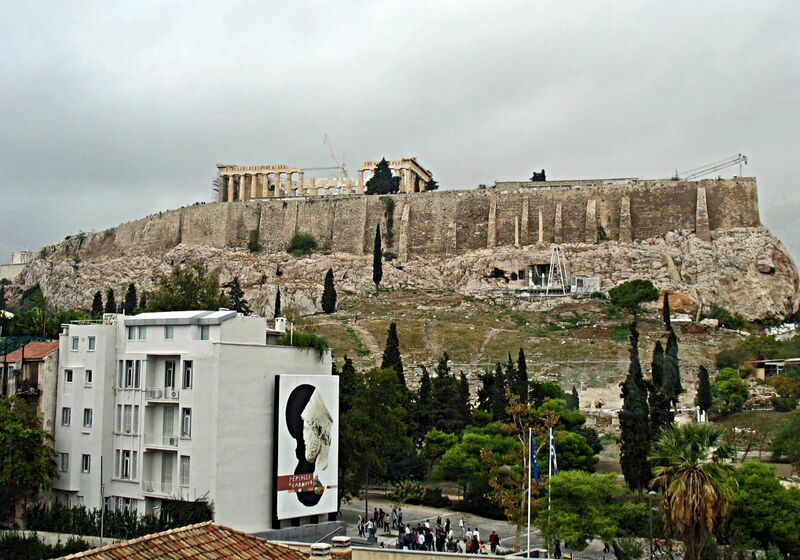 This is a view of the Parthenon temple from a distance, from the musueum. Not much of it is left but the Greeks are trying to restore it. It lies on top of a small plateau. A closer look at the Parthenon, which is an example of the classical Greek architecture, the Doric style. The white marble seen in some places is new, having been newly constructed. The yellower stone is the ancient marble which has yellowed with age. These are photos of policemen in India. Pictures of Indian Police. 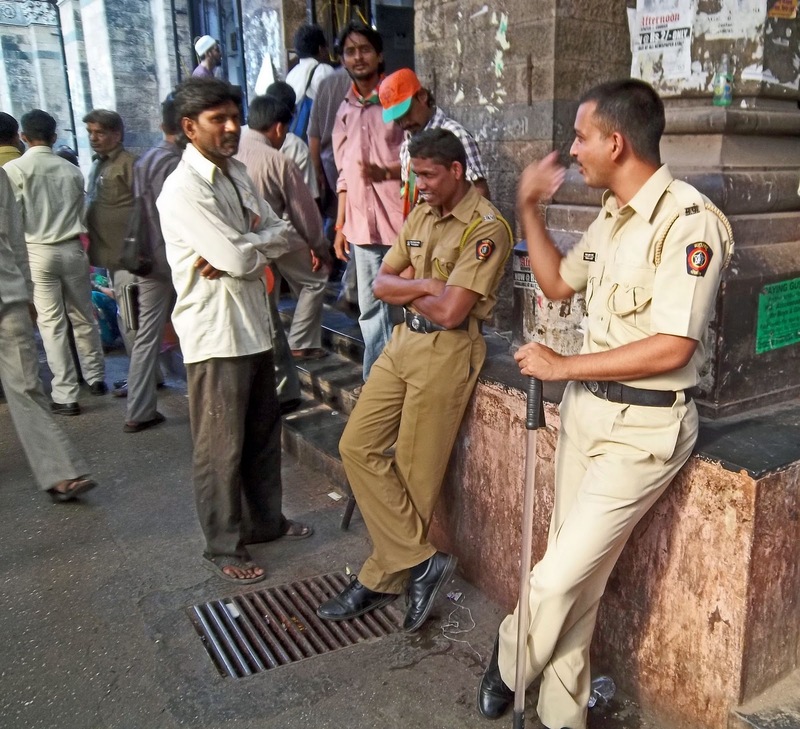 This is a photograph of a couple of railway policemen caught on camera on duty outside VT railway station in Mumbai. The cops share a light moment with some passersby. 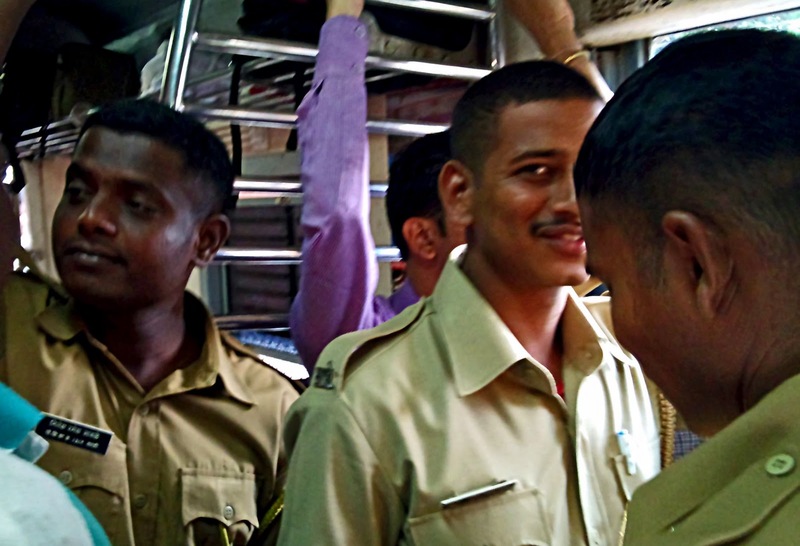 Fresh and happy railway recruits on a subway train. This is a railway policewoman on duty at Mumbai Central railway station. 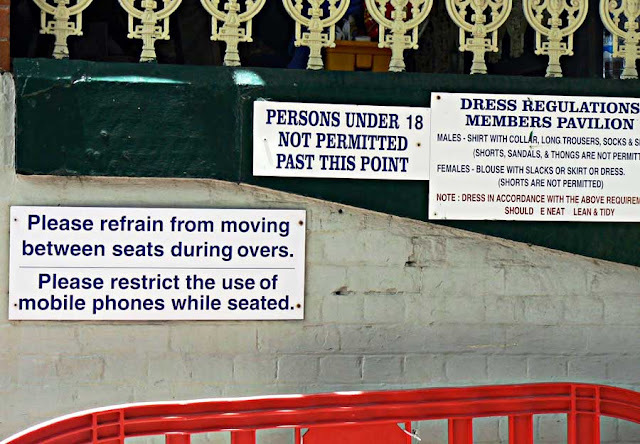 Or more pictures on "Railway" or "Security"
Interesting signs with funny instructions! 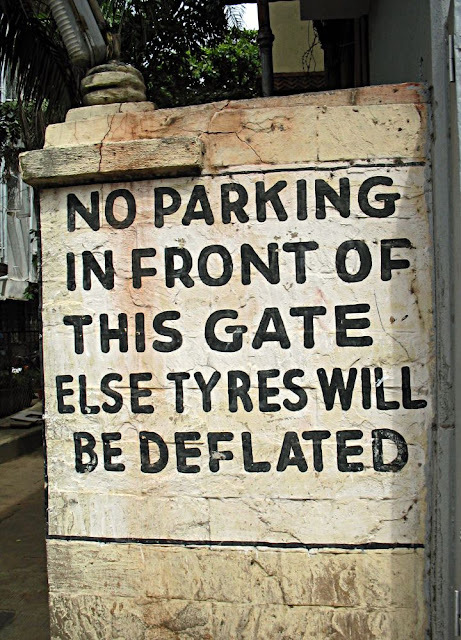 These are some funny signboards, most of them from different parts of India. They are funny for different reasons, mainly for their quaint and silly instructions! 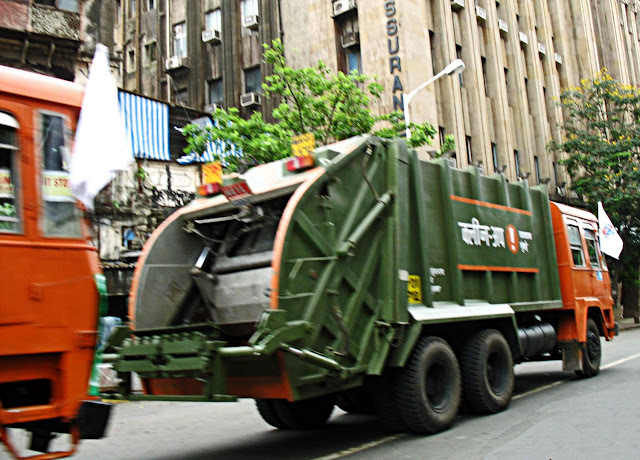 This is a common and brazenly illegal method that people use to prevent people from illegal parking in Mumbai and Pune. No use calling the police so people take the law into one's own hands! At least the owner of this sign had the decency to mention the vandalism that lay in store for anyone who parked in front of his gate. In most cases there is no such warning sign, and often no "No Parking" sign either. I wonder why people think that literate people follow instructions and laws!! Education has nothing to do with it! Fear does. And there is no fear of the police. 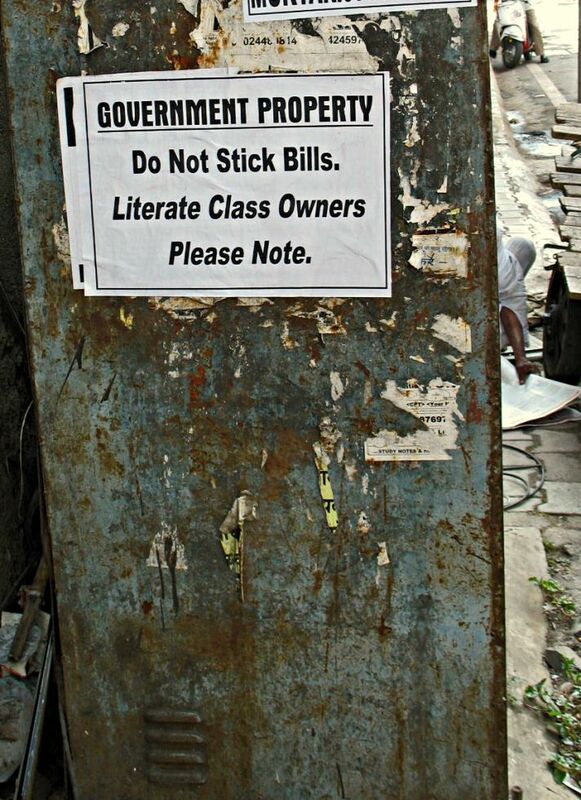 This sign was seen outside a lift, but not in India. Actually these signs explaining how lifts are to be operated should be put up outside every single lift in India. It is very inconvenient when people press the wrong lift buttons and the lift opens unnecessarily, causing delays and wasting electricity. 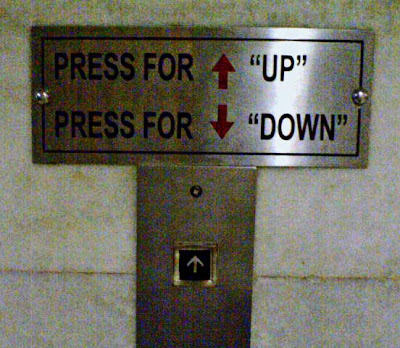 Even educated people have no idea that to go up one has to press the "Up" button and to go down they have to press the "Down" button! It may seem common sense to people who have been using lifts for a long time, but for newbies it can become confusing! Another very obvious sign! Observe traffic rules!! Because the majority do not! This sign chockfull of instructions at the Bradman cricket stadium in Sydney, Australia, may seem quite normal but its funny because of the missing letters on the signboard at the right of the picture. In any case I wonder how they propose to evaluate whether a person is clean and tidy? 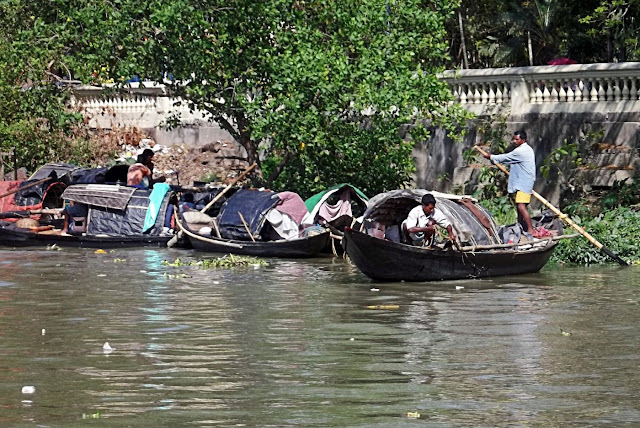 Canoes are mostly used by poor fishermen on the river Hooghly in West Bengal, India. The Hooghly river is a distributary of the River Ganges. None of these canoes is motored. Long oars are used to move the boat along. This is a silhouette of a long canoe on the river Hooghly in Kolkata. 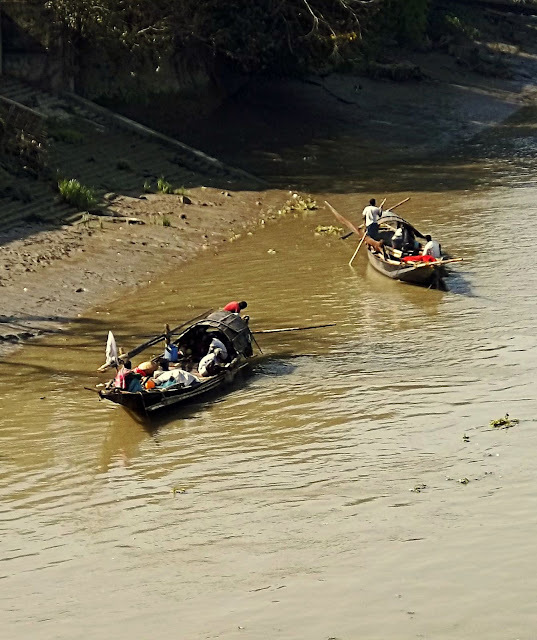 Two men at each end of the boat can be seen with long oars. In the background are some buildings in Kolkatta, West Bengal. These are fishermen. 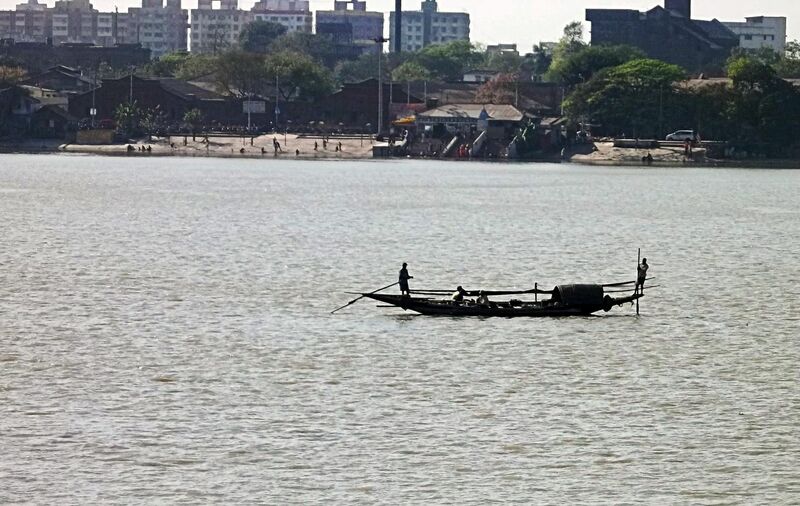 Here are two boats on the shore of the river Hooghly. 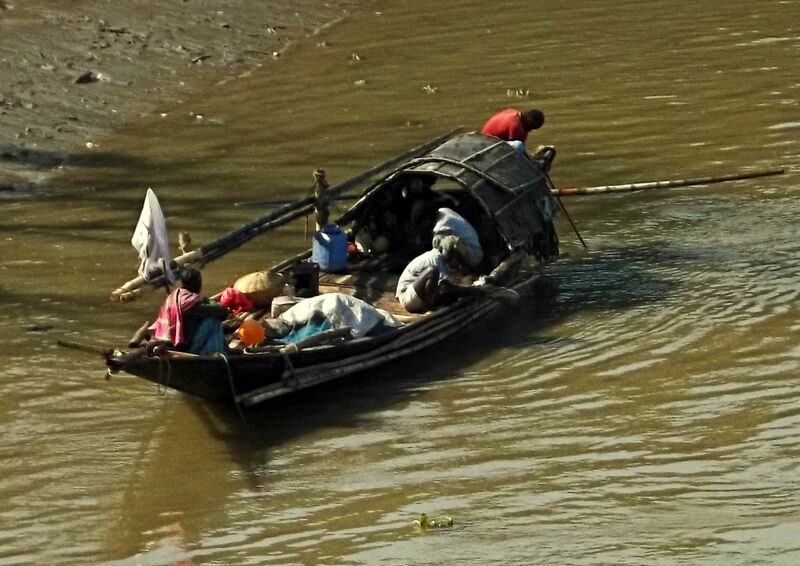 A closer look makes you realise that people live on the boats for long periods. A couple of men on the boat. The river water looks muddy and dirty. Thick with pollution. 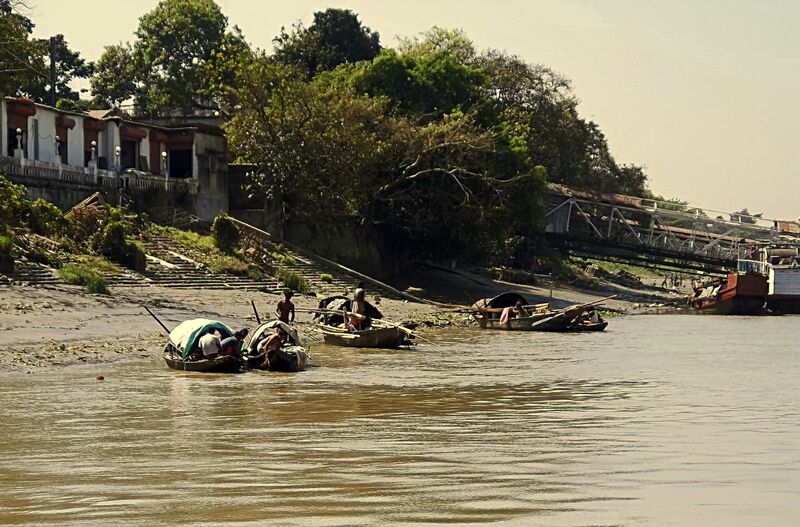 More boats on the river Hooghly. Garbage is collected at different places in the city by these garbage trucks which are usually in deplorable condition. On their way to the dumping ground they often spill garbage which has been collected and its best not to behind this type of vehicle! 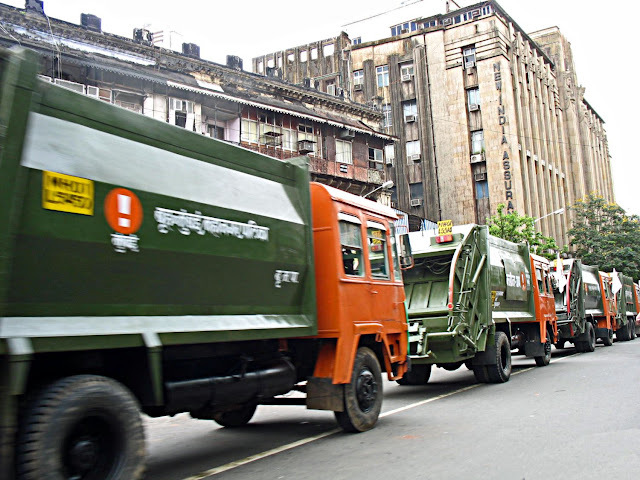 These are the new clean-up trucks of the Mumbai Municipial Corporation. Look far better but not enough of them! A closer look at the clean-up truck. 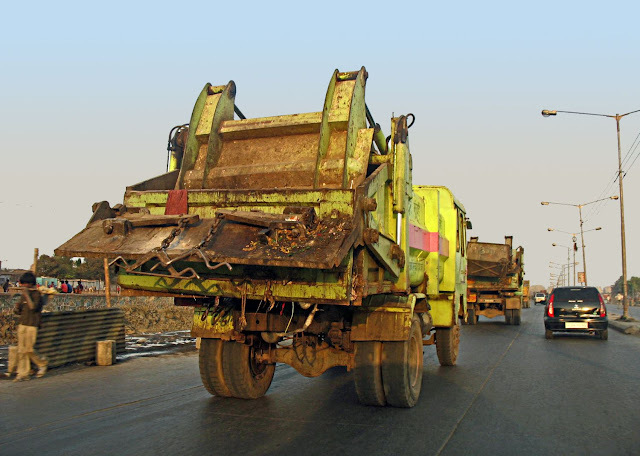 Related Imagery: Garbage on the roads in India or garbage dumped by a multi-national on a public road - KFC Garbage or check out more posts on Sanitation. 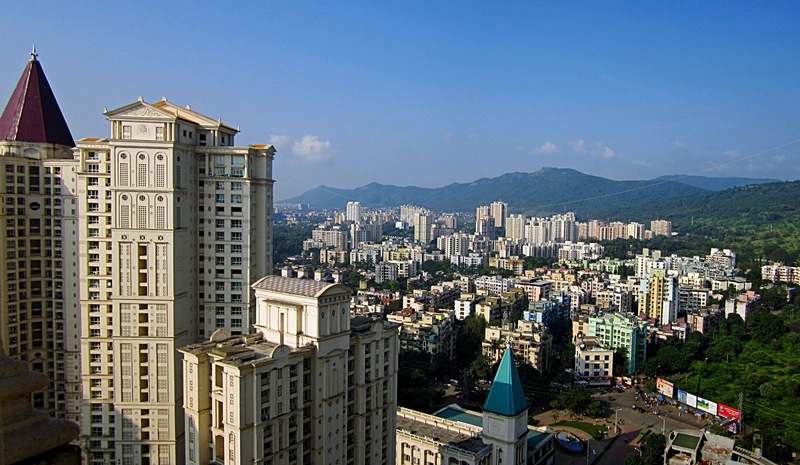 Thane lies at the head of the Thane Creek and is surrounded by the hills of Yeoor. Thane Creek runs through the city, which is a stream of water from the Ulhas river and Arabian Sea. The city has around innumerable lakes. The Upvan Lake is located at the foot-hills of Yeoor hills and a popular recreation place for Thaneites. In the background of this image you can see the Yeoor hills and also Neelkanth Heights, the skyscrapers in the distance at the foot of the hills and Upvan lake. The lake itself is not visible in the photograph which was taken from one of the top floors of an apartment in one of the skyscraper towers of Hiranandani Meadows. This photograph captures the old and new modern Thane very well. The old in the background at the Yeoor foothills and the brand new skyscrapers now dotting the city. 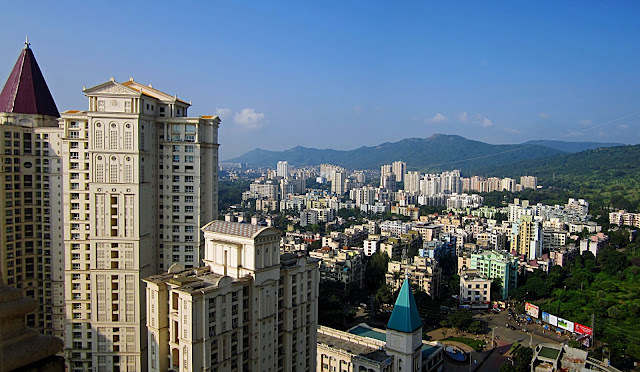 Related Images: Lavasa hill city near Pune or Scenes from the Matheran Mountains or Ghat or try the labels below this post or click on Urban Landscapes for more images of different cities from India and around the world.